A physicist from the University of Heidelberg, Dr. Christof Wetterich, published: “A Universe without expansion” on http://arxiv.org/abs/1303.6878/ Even though the paper is not peer reviewed, the magazine Nature examined Dr. Wetterich’s claims. Wetterich suggests that mass everywhere is increasing. He theorizes that as subatomic particles increase their mass, the light they emit becomes more energetic, bluer. Since we can see the past with telescopes, we observe redder stars that were intrinsically redder. Wetterich’s theory does not need to imagine that the vacuum of space time is expanding, thus stretching light passing through the void. All he has to do is claim that matter changes as it ages. I wonder if Christof is aware that 3,000 years ago the Egyptians painted the Sun red and the sky tan? Homer wrote of the bronze sky. Is he aware that people never seemed to notice a blue sky until a few centuries ago? Nature pointed out that there is a problem with Dr. Wetterich’s theory. Even though the idea is plausible, it cannot be tested empirically. Mass can only be measured relative to something else, such as a standard kilogram. If all platinum cylinders were changing as they aged, the balance scale could stay balanced even as “mass” changes. (Christof is surely aware that standard platinum kilograms, stored under different gravitational environments, no longer balance when they are brought together for comparison). Something fundamental seems to be changing! I am sure Dr. Wetterich, being an eminent physicist, is aware of the Pioneer Anomaly. NASA compared hydrogen maser atomic clocks with the frequencies they emitted hours ago, transponded through the radio signals of four distant spin-stabilized spacecraft. The signals showed an unexpected anomaly. Dr. John Anderson, from Jet Propulsion, suggested one solution to this anomaly is that all atomic clocks are accelerating at (2.92±0.44) × 10^-18 s/s2. Anderson’s estimate for the Pioneer Anomaly is close to the Hubble ratio times the speed of light. Astronomers use the Hubble ratio and the speed of light to estimate the distance to a countless galaxies using their observed light clock rates. The Pioneer Anomaly suggests that Dr. Wetterich is right, that ancient atoms clocked lower frequencies than modern atoms because even local atoms continually accelerate their clocks signals. The problem with Dr. Wetterich’s theory is that it cannot be tested empirically. That is not the same as saying it cannot be tested. Scientists define mass operationally, as they do the other fundamentals: time and energy. An operational definition is not concerned with whether mass, energy or time actually exist. Scientists simply invent a mathematical procedure and use it to define something. For example, they use cesium atomic clocks to measure fixed duration seconds – by definition. The operational definitions for the fundamentals also depend on each other in a circle. Most of the empirical measuring units, mathematical constants and laws of physics depend on the assumption that atoms are not changing relationally as they age. Wetterich’s theory is simply not scientific because it questions the historical, foundational assumption for western science. There is a simple way to test whether atoms change as they age. We can see the past. This photo is from NASA’s Hubble Ultra Deep Field. HUDF galaxy 4491 shines at 48% of the frequencies emitted by modern atoms. 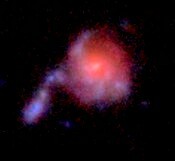 Notice the string of equally spaced blueish star globs emerging from the redder core of this galaxy. By comparing the shapes of galaxies at many ranges, we observe that stars in came out from point source cores. Evidently the space matter takes up, its light frequencies and its inertia change together. Relational change is when the properties of matter shift together, in parallel. You can test for relational change with light, but not empirically. Think about it!